See my mini-series here on the life of Martin Luther. 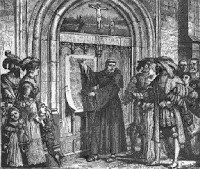 On October 31, 1517, the story goes, an Augustinian monk named Martin Luther nailed to the door of the Castle Church in Wittenberg, Germany 95 propositions or theses and marked the beginning of the Reformation. Of course, the Reformation began long before that, but this date proves to be a convenient coat hanger for historians to mark the beginning of the Protestant* Reformation. However, the 95 Theses were not intended as a call to reformation, and it is the story behind this event that proves so fascinating and shows the real purpose of the 95 Theses. Prince Albert of Brandenburg wanted the archbishopric of Mainz. You may know the city of Mainz as the home of a goldsmith named Johann Gutenberg, who had developed the uniform-sized movable type printing press some 60-70 years earlier. Because Albert was younger than 25 years old, and because holding multiple archbishoprics was forbidden, the office of archbishop required a dispensation that would cost him 23,000 ducats (about $500,000.) Pope Leo X, who was financing the building of St. Peter’s Basilica in Rome (for $46 million) suggested that Albert borrow the money from the wealthy Fugger banking family. Albert was able to secure half the funds from the Fuggers, and for the rest he sold indulgences. An indulgence was a document which freed the holder from the temporal penalty of sin. The sale of indulgences, originally introduced during the Crusades, remained a favored source of papal income. In exchange for a meritorious work — frequently, a contribution to a worthy cause or a pilgrimage to a shrine — the Roman church offered the sinner exemption from his acts of penance by drawing upon its “treasury of merits.” According to the church doctrine of ex opere operato, this consisted of the superabundance of grace accumulated by Christ’s sacrifice on the cross along with the meritorious deeds of the saints. This surplus, dispensed by the Pope, could be used by sinners. In Castle Church at Wittenberg for example, it was believed that the relics (bones of saints or other articles from biblical characters) collected there were reckoned to earn a remission from Purgatory for pilgrims of 1,902,202 years and 270 days. To Martin Luther, the professor of biblical studies at the newly founded University of Wittenberg, Tetzel’s preaching was bad theology if not worse. His parishioners were not coming to confession, informing him that they’d already “paid” for their sin. Luther thought this practice was wholly unwarranted by Scripture, reason or tradition. He felt it encouraged not repentance but mere payment. Luther promptly drew up 95 propositions or theses in Latin, following university custom, for a call to theological debate. This was not what Luther originally intended, like hitting “reply all” and not being able to call it back. Among other things, the 95 Theses argued that indulgences could not remove guilt, do not apply to purgatory, and are harmful because they induce a false sense of security in the donor. So, the 95 Theses were not a general call to break with the Roman Catholic Church. Rather he intended to begin his debate on the theses or “The Disputation on the Power and Efficacy of Indulgences” by discussing the sale of indulgences and the biblical limits of Papal power. The irony is that his friends, to whom he had sent private copies, took the 95 Theses and translated them into German, the language of the common man. And with the aid of Gutenberg’s printing press copies were distributed to the masses: it went viral. This was the “spark” that ignited the Reformation. Consequently, many Protestant churches celebrate October 31 as “Reformation Day” and the closest Sunday to it as Reformation Sunday. For it was on that day that Luther sent his 95 Theses to his superior, the aforementioned Albert of Brandenburg, now the Archbishop of Mainz in whose name the indulgences were being sold, to humbly bring it to his attention. But Luther did not know about Albert’s investment in the indulgence sales as mentioned above. Curiously, it mentions plural churches, suggesting all of the half-dozen churches in Wittenberg carried the call to debate. All in Latin. 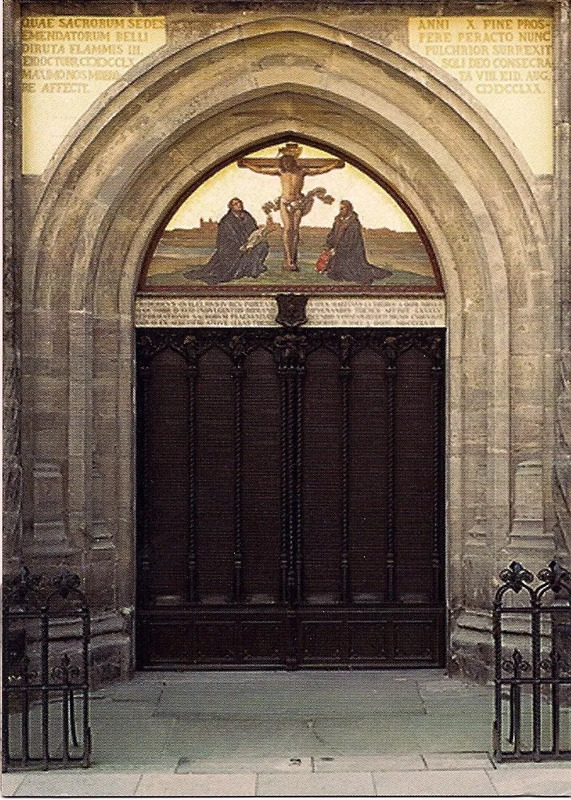 Did Luther “nail” the 95 Theses to the Wittenberg door? Did he attach them with thumbtacks or a hammer? I’ve noticed over the years that pictures depicting the size of the hammer have grown from a ball-peen hammer, to a clawhammer, to a mallet, to a sledgehammer, to Thor’s mystic Uru hammer Mjolnir. But Luther did mail the 95 Theses. Probably using a hammer. Indeed, it has been said that Martin Luther was the last medieval man, and the first modern man. And in church history, this was the dawn of the Early Modern period. Don’t let Halloween overshadow Martin Luther’s 95 Theses! Michael Eayrs liked this on Facebook. Chuck Dunn liked this on Facebook. Ian Millar liked this on Facebook.